Many patients who come to our dental office ask us if we recommend manual or electric toothbrushes. 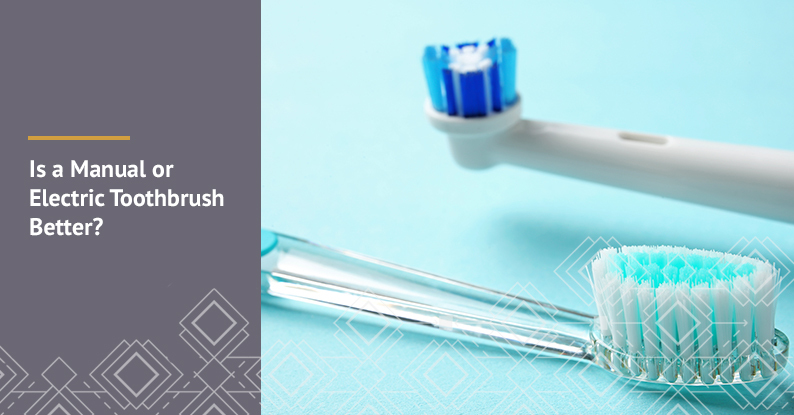 While the American Dental Association has said that both styles of toothbrushes are effective at removing plaque, many people don’t realize that there is a difference in the clean that you get when using an electric toothbrush. As with anything, there are pros and cons to using each. Let’s take a look at some of them. Electric toothbrushes are better at removing plaque at the gum line without damaging gums. The vibrations and brushing motions that it makes breaks up plaque and pushes it away from the teeth and gums much more effectively than manual brushing. The other positive thing about electric toothbrushes is that they have timers to ensure that people are using them for the full 2 minutes needed to get a good clean. They are also easier for people with dexterity or mobility issues to use. However, as you might already know, they are much more expensive than manual toothbrushes. They also require you to purchase replacements heads, which sometimes can be hard to find and expensive to get up front as well. Over time, they may also require battery replacements. The American Dental Association says that manual toothbrushes are also effective at removing plaque and preventing gingivitis. The greatest benefit to manual toothbrushes is that they are inexpensive and easily accessible. You can find one at any grocery store or gas station. People that use manual toothbrushes often aren’t brushing for the full two minutes needed to get an effective clean. They are also much more likely to brush their teeth too hard causing gum and enamel damage. Manual toothbrushes are also harder for people with arthritis or other dexterity issues to grip and use meaning that they likely aren’t getting their teeth and mouths very clean. At Downtown Dental Group, our doctors and hygienists recommend electric toothbrushes. We believe that the benefits outweigh the costs, and our patients see and feel a difference from using an electric toothbrush. The Phillips Sonicare is great for both children and adults. Other brands are acceptable and our hygienists will help you find the right electric toothbrush for your family. To learn more about the benefits of using an electric toothbrush, request an appointment.